To make reservations for an airport shuttle for Gathering, go to the Shuttle Page on the SEA-TAC website. At the end of the Seattle Post Gathering Tour, the bus will drop participants off at SEATAC, or the hotel district. 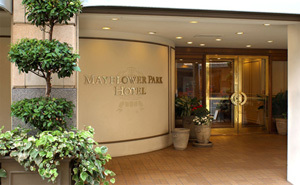 For your convenience, TLS has reserved a block of rooms at the Mayflower Park Hotel, 405 Olive Way, Seattle, for those who wish hotel accommodations after the Gathering. This hotel is right next to Westlake Center and the Sound Transit Lightrail System connecting directly to SEA-TAC. It's only a 40 minute ride and costs less than $5.00. You must make your reservations by October 1st to take advantage of the room bloc. Reservation link and web code for the Labyrinth Society Inc. group – October 30, 2017 – Web code = LSI2017. The phone number directly to the hotel is: 1-800-426-5100 or 206-382-6990.